One of the most frustrating parts of being foster parents is that we rarely get to have a date night. With all the stress that comes with parenting traumatized children, we NEED time together. But due to regulations for foster homes and our child’s sometimes behavior issues, we can’t just leave our kids with anyone. So we have to think outside the box. We can have “date nights” at lunch while the kids are in school. Our kids love going to Austin’s Park & Pizza — they can play video arcade games, laser tag, putt-putt, or ride go-carts and rides. And hubby and I can visit without constantly nagging our rambunctious boys to sit down. We like Austin’s Park & Pizza because it’s free for our family to enter! With al a carte pricing, we only have to pay for what we want to do or eat. We usually just purchase full-park passes for the kids and then just the pizza buffet for us. But now with a new renovation, Austin’s Park & Pizza has opened a full-service bar & grill (called Austin’s Bar & Grill) and new bowling lanes. So now there’s something for everyone – including couples, like us, looking for a unique date night experience, even with the kids. Perfect for a family like ours that struggles to find child care. The boys can play in the arcade while we eat a nice dinner. Win win! Austin’s Bar & Grill has a new grill menu by including gluten free, organic and fresh local farm-to-market items. Check out this Organic Chicken, Kale & Spinach Salad I ordered. How’s that for thinking outside the box for date night ideas? What date night ideas work for your family? Let me know on Facebook! Disclosure: I was provided full-park passes to Austin’s Park & Pizza for me and the kids. (My hubby had to go out of town for a family emergency.) But we love to come here regardless. My son insists on coming here for his birthday each year. Now that my son is getting older (he just turned 8) – he recently re-introduced me to the “joy” of riding roller coasters, and at SeaWorld, no doubt! Did you know SeaWorld rides include roller coasters? When was the last time you rode a roller coaster? We are talking decades for me! Last time I rode a roller coaster, I had a “Rachel” haircut and my CD collection was comprised of grunge rock bands. Before I tell you what happened after a two decade absence from thrill rides…. SeaWorld has a variety of rides depending on your bravery level or degree that you wish to get wet. For toddlers and preschoolers, Sesame Street Bay of Play is the SeaWorld attraction must. Plus the little ones can choose to stay dry or get very wet on the splash pad. Check out all the fun this same son had as a 3-year-old when SeaWorld opened Sesame Street Bay of Play a few years ago. Although Journey to Atlantis is part roller coaster and part water ride for those over 39” tall but we really didn’t want to get wet just yet! Rio Loco is another SeaWorld ride that gets you wet. It’s like a whitewater rafting trip for those over 39” tall and you will get soaked. Steel Eel on the other hand is strictly roller coaster. Was my 8-year-old ready for this “big kid” roller coaster? Was I? Our sensory-seeking son was so excited to finally be just tall enough at 48 inches tall to ride his very first roller coaster!!! And can you guess which parent had the exquisite pleasure of riding the Steel Eel with him? During this roller coaster feat, I screamed like a hysterical madwoman giving birth to 20-pound quadruplets – the entire ride – up & down & over again! While I was screaming my lungs out as gravity reeked havoc on my senses, my brave little boy quietly smiled and held my hand. My son amazes me! His body enjoyed the sensory stimulation of the roller coaster. Honestly, Steel Eel has no flips or sharp turns – just those really tall ups and downs – that made this scaredy-cat scream like a banshee. There’s also the Great White roller coaster ride at SeaWorld! That roller coaster, for those over 52” tall, places you in the seat with your legs dangling down as you go up and down AND upside down. Oh, hell no! I’ll stick with the Steel Eel. What I learned by riding a roller coaster with my little boy, is that he is quickly becoming a little man right in front of me, and he showed me that bravery doesn’t have an age! Disclaimer: I purchased tickets for me and my family to attend SeaWorld’s AdventureCon blogging conference in San Antonio and received no compensation for doing so. All opinions about riding roller coasters at my age are my own. Looking for spring break activities for families? But what if you have a large family? Are you looking for things to do with all your kids without breaking the bank? DAY AT THE PARK – A cheap and easy spring break activity to do with your large family is to spend a day at a local park. You can pack a lunch, snacks, and drinks. You can make this easy kite out of a paperbag and streamers. HIKING – Take your big family on a hiking trip during spring break. Here are 7 great tips for hiking with kids. CAMPING – You don’t have to spend a bundle to go camping with your large family. Here are some great camping tips you should check out! Also, be sure and get a tent that has a tall height so you don’t have to slump over to walk inside, such as this 8-person family tent with a center height of over 6 feet! 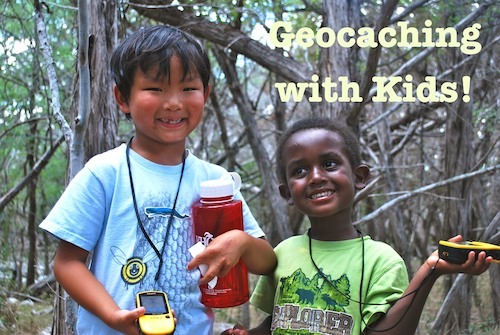 GEOCACHING – Go on a treasure hunt with your kids during spring break! Geocaching is treasure hunting with a GPS. Begin by going to geocaching.com to find where over 2 million small “treasures” (called geocaches). Find your location and then solve the clues to find the treasure! FAMILY PIZZA NIGHT – Make homemade pizza dough and have each kid in your family make their own pizzas! Let each child add as much of their favorite toppings to their own personal pizza. Great for those with picky eaters too. FAMILY MOVIE NIGHT – With no early school mornings, enjoy a family movie night together – complete with snacks and lots of popcorn. FAMILY ROADTRIP – There’s nothing that creates memories and true family bonding than a family roadtrip. Here are some great tips on how this family takes BIG trips on a small budget. And check out these road trip tips for LARGE families! STAYCATION – You can have a fabulously fun spring break at home by planning a staycation where your large family completes a fun “bucket list” of things to do on spring break locally. Whatever activities you do with your kids during spring break, the important thing is that you have fun in your family bonding time! The week before our Disney Cruise last fall, we discovered that Disney Cruise Lines hosts a Pirates in the Caribbean night. Not only does the cruise staff dress in pirate costumes, but everyone does!!! That sent us scrambling at the last minute for pirate costume ideas. We met Captain Jack Sparrow, the star of Disney’s Pirates of the Caribbean! Pirates in the Caribbean! Party on the deck! Also, check out this cute Womens Pirate Costume for $20. Disclosure: Links in this post are affiliate links to Amazon, which means if you click on a link & purchase an item, I receive a tiny commission as an Amazon gift card so I can shop on Amazon. See how that works nicely for Amazon? The majority of this summer, our family was larger by 2 foster children. A little girl that we thought would be a good playmate for our 6-year-old was a parenting challenge. Plus, I had forgotten just how HARD it is to take care of an infant, especially one that is already exhibiting signs of hyperactivity with NO napping. We were ALL stressed out. When the foster children left at the end of July, we realized that our family had been so busy in this chaos, that we hadn’t planned a summer vacation! After the stress of constant bickering, we ALL needed a nice break! After discussing our options, we were excited about a getaway to the Dallas Metroplex, and opted to stay in Arlington with all the family activities there. Did you sneak in a summer vacation with your family? Where did you travel? After being foster parents for 3 little ones in addition to our 2 preschool boys, we were in desperate need of a vacation! We were elated to learn that Disney Cruise now has family cruises leaving out of Galveston! We wouldn’t have to travel to Florida with our young boys to experience Disney magic! In less than 24 hours, we booked a Disney cruise. Our Disney Cruise was a magical experience for all of us! We loved meeting all the Disney characters up close and personal. One thing we quickly learned was that the cruise ship’s gift shop did not take cash; however, they did accept MasterCard for our on-board purchases. Our Disney cruise included a port stop in Grand Cayman, which offers a variety of excursions including Seven Mile Beach, Cayman Turtle Farm, snorkeling adventures, etc. We booked our excursions ahead of time to ensure that we would have a reserved spot. Since not everyone in my family is as adventurous as me; afterward, I met dad and the kids at Rum Point, a relaxing, quiet beachfront with a variety of eating stands in little huts, and of course, a gift shop! The currency used in Grand Cayman is the Cayman Islands dollar (CI$) which has a fixed exchange rate of US$1 equal CI$1.20. Souvenirs from Cayman include the famous Tortuga rum cakes, postcards from Hell, and anything turtle. We purchased our souvenirs (including turtle salt and pepper shakers for my in-laws) at the gift shop there at Rum Point using our MasterCard because it is accepted everywhere. Due to some complicated IRS rules, many merchants abroad do not accept all credit cards anymore. But MasterCard is accepted everywhere! Our Disney cruise included 2 other port stops in Mexico: Costa Maya and Cozumel. Because the Mexican Pecos fluctuates in value between 10-15 Pecos for $1US, it’s easiest to purchase with MasterCard. MasterCard automatically converts Pecos to US dollars with the best currency exchange rate with no additional fees. We purchased souvenirs and silver jewelry in Cozumel; however, we did NOT purchase any Cuban cigars! If you’re looking for a credit card that you are sure will be accepted anywhere abroad while traveling, I would recommend MasterCard. For more Disney Cruise pictures, including dolphins, be sure to check out my Google+ Story! As part of a sponsored post for Collective Bias®, I’m sharing my experience of how MasterCard was accepted everywhere on our recent Disney Cruise vacation to the Caribbean. We needed a vacation! And then something magical happened! Disney Cruise Lines announced cruises out of Galveston! We quickly booked a week-long Caribbean cruise with Mickey, Minnie, Donald and the rest of the Disney gang. I highly recommend Disney Cruise Lines! It was the best!!! You never know when your child may get sick, break an arm, etc. You can get steep discounts on available rooms. We could have upgraded from an interior room to a larger room with a port hole for $200; however, being the budget travelers that we are, we chose to spend that money elsewhere, since we spent so little time in our room. We made the mistake of bringing cash to spend on the ship for souvenirs; however, the ship’s gift shop only took our room key or credit cards for purchases. Think of what activities you or your kids might want to do the afternoon of boarding. If your kids are waterbugs, like mine, bring swimsuits and pool paraphernalia in a carry-on so you don’t have to listen to your kids whine all afternoon because they want to get in the pool. Since stateroom doors are made of metal, use magnets to decorate the door to your stateroom so your kids can find your room easily among the sea of doors that are identical. I cannot even read a map in the car without feeling woozy. Although, I did get “the patch” for the cruise, if you would like a more natural (and less expensive) alternative, consider taking Ginger Root capsules. I used it considerably when my former job had me flying in a helicopter with a former Vietnam chopper pilot. My kids begged to spend time in the Oceaneers Club for kids. In fact, one evening, our Kindergartner didn’t asked to be picked up until nearly midnight! !